-RNA virus, dsDNA virus and lentivirus genomes enter via the nuclear pore complex (NPC) through the cellular Importin transport. -ssDNA virus capsid seems to be small enough to cross the NPC and enter the nucleus as an intact capsid. -Hepadnaviridae capsid would enter the NPC pore, but remains attached to it and releases the viral genomic DNA into the nucleoplasm. -Herpesvirales capsid is too large to enter the NPC pore, the viral genome is directly injected through the NPC on which the capsid docks. -All retroviridae except lentivirus would enter the nucleus during mitosis, when the nuclear membrane temporarily disintegrates. All these strategies to cross the nuclear envelope barrier are associated with various levels of capsid disassembly, since virus can pass intact (e.g. 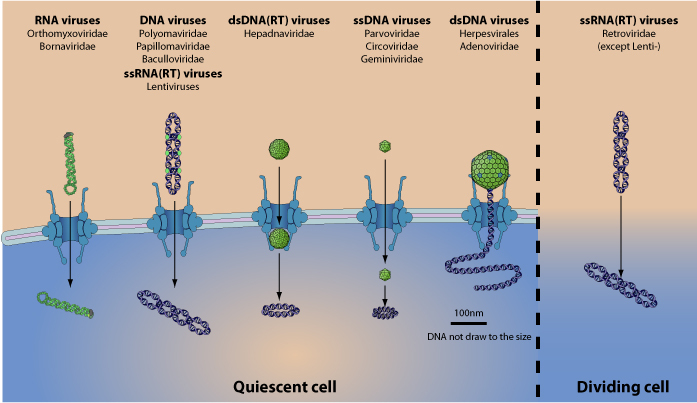 parvoviridae) or, in the case of injection, only the viral genome enters the nucleus (e.g. herpesviruses). Genome integration in the host genome may eventually follow . Sarah Cohen, Igor Etingov, Nelly Pant?